Have planetary reclassifications occurred before Pluto’s? Yes, and one is bound to occur again someday. In ancient times, the term planet meant any object that moved naturally across the sky compared with the background view of the stars; that meant the planets included the Sun, Moon, Mercury, Venus, Mars, Jupiter, and Saturn. Over time, the planet Uranus was discovered in the late 1700s, and the Sun and Moon were dropped from the category. In the 1800s, nearly a dozen small objects that orbited the Sun were declared to be planets; they were then reclassified as asteroids, but Neptune was not and remained a planet. Pluto’s reclassification is just the latest in the long history of astronomy. 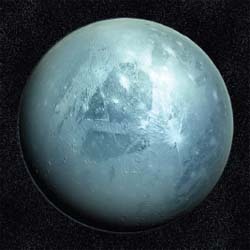 An artist’s depiction of Pluto.